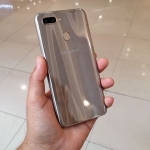 I've been using the OPPO A71 (2018) smartphone! 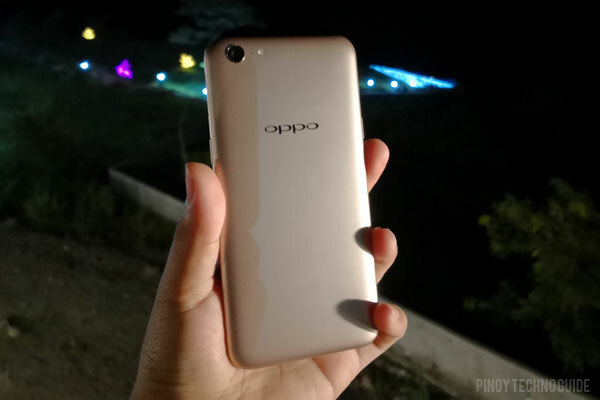 After using the OPPO A71 (2018) for several weeks, it impressed me in three aspects – gaming performance, photography and battery life. However, it also has its compromises since it comes in at an affordable price tag. Let’s examine its strengths and weaknesses in this in depth review. The phone looks good whether during the day or at night. 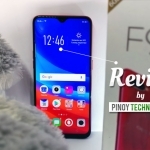 The OPPO A71 (2018) has a no nonsense design with the traditional 16:9 aspect ratio. 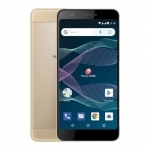 It doesn’t have the tall display of its sibling, the OPPO A83. Nevertheless, it fells sturdy with no weak points and one hand usage is a breeze. Bezels are substantial but the ones on the sides seem narrow when the screen is off. It uses capacitive buttons below the display for navigation and has the front camera, earpiece and sensors above the screen. There’s no LED notification light though. The loudspeaker is behind the right grille. Its left side has the SIM card tray and power button while the other side has the volume rocker. 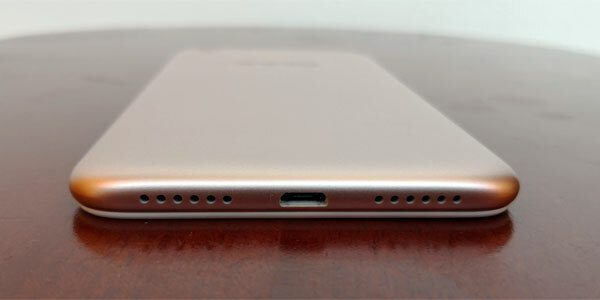 The bottom is where the speaker grilles and microUSB 2.0 port are located while the 3.5mm audio jack is on the top. Of course, the main camera, its LED flash and the company’s logo are all on the back. Themes, Messenger and quick settings. 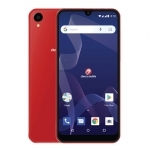 The OPPO A71 (2018) has a 5.2-inch HD display. It’s smooth, responsive and supports up to four touch points at the same time. It comes with the company’s customized skin on top of Android 7.1 Nougat called ColorOS 3.2. 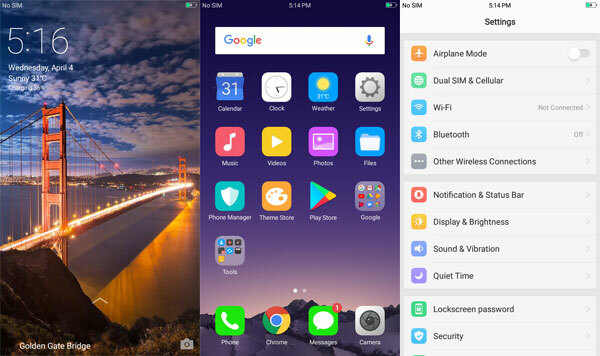 The design is iOS inspired and takes some getting used to when coming from more stock-like skins of Android. 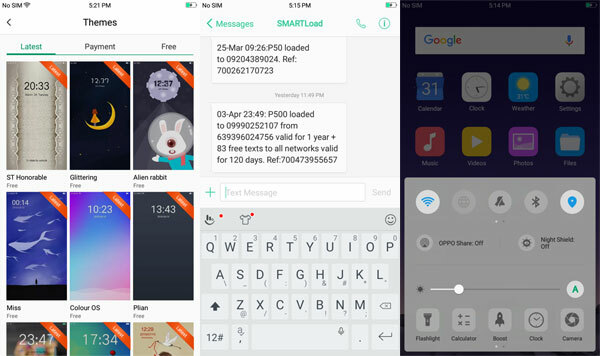 Nevertheless, the user interface looks clean including the native apps such as the Messenger, Phone Manager and Camera. Thankfully, there’s not much pre-installed apps aside from those from Google and a Theme manager. 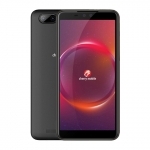 Since the OPPO A71 (2018) runs on a Qualcomm Snapdragon 430 processor, its performance in day to day tasks is superb. Apps launch immediately, scrolling is smooth and animations are fluid. The 2GB RAM can sometimes choke the phone’s smoothness when a lot of apps are running in the background. A quick clearing of the recent apps solves this problem. 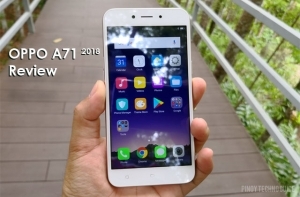 In terms of gaming performance, the OPPO A71 (2018) is impressive for the price. Casual Android games run flawlessly. Moreover, more complex apps like Mobile Legends and Shadow Fight 3 also run smoothly even in high graphics quality. However, resource intensive games including Rules of Survival shows lags and dropped frames when the graphics quality is maxed out. At medium graphics setting, the game becomes smoother with just the usual issues in busy scenes. 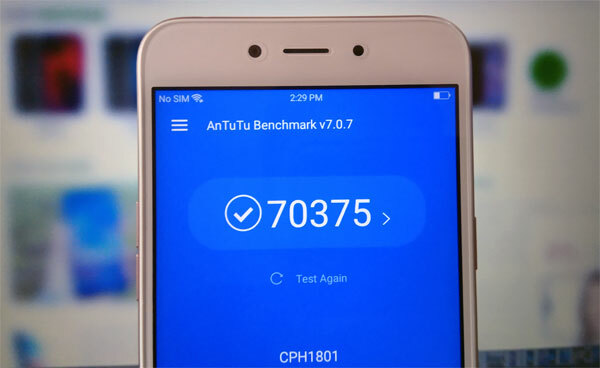 It scores a little over 70,000 points on Antutu benchmark v7.0.7! The 13 Megapixel rear camera of the OPPO A71 (2018) is surprisingly good especially in landscape photography. Photos look sharp and vivid while its dynamic range is decent. Likewise, low light is above average and can render likeable photos of light landscapes. I’m also impressed by the phone’s 5 Megapixel front camera. It can take good looking selfies in good lighting scenarios. The crux is in its slow light performance. Night time selfies almost always end up grainy even if the screen flash function is engaged. 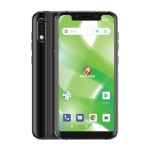 The OPPO A71 (2018) is a dual SIM smartphone with 4G LTE connectivity. 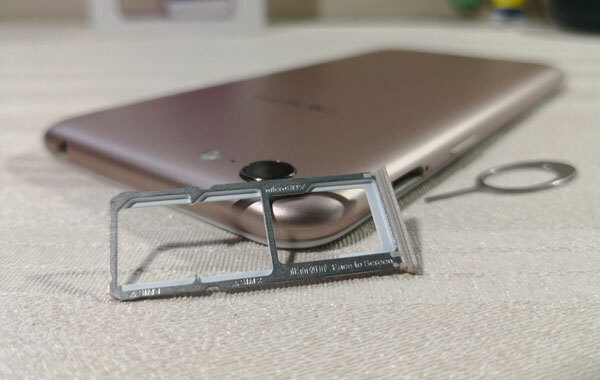 It has dedicated slots for the two SIM cards and a microSD card. Calls and texts are a breeze while mobile data is speedy. I often used it as a Wi-Fi hotspot especially when I’m not in the city where 4G signals are not that strong. Even then, it always provide a reliable mobile internet connection. Hopefully, OPPO adds a 4G only option in the preferred networks of the device. 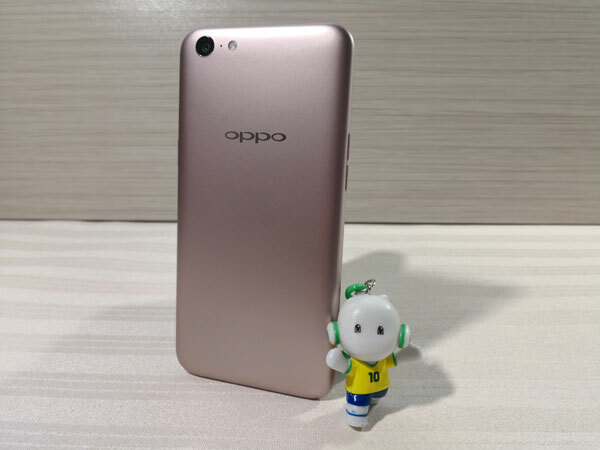 The OPPO A71 (2018) comes with free earphones but the audio quality has a lot of room for improvement. That’s also the case with its loudspeaker although its loudness is acceptable. Since it’s a gaming smartphone, OPPO made sure that it is equipped with a gyroscope for AR games and apps. The most well-known example is Pokemon Go. However, it lacks a fingerprint sensor which means the user has to rely on a 4-digit passcode for security. 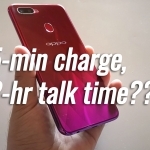 Battery life is another impressive aspect of the OPPO A71 (2018). It has a non-removable 3000mAh Li-ion battery. This is enough for two days of minimal use in a single charge! That includes calling, texting and a bit of social media usage. 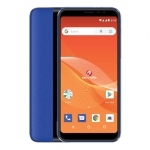 I’ve mostly used it with mobile data and Wi-Fi hotspot function turned on and it hasn’t failed to last a whole work day. It scores a little under 14 hours on PCMark’s battery life test at 50% brightness and airplane mode. However, charging time is a bit long at two hours and 45 minutes. There are a lot of options when it comes to smartphones nowadays. 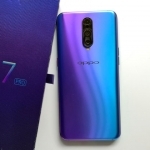 I’m happy that OPPO has dramatically improved their offerings in terms of both price and features. 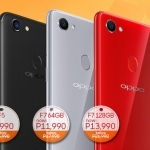 The OPPO A71 (2018) has impressive performance, main camera and battery life for an official price of ₱7,990.00. Just take note that it doesn’t have a fingerprint sensor and taking selfies at night isn’t its strength. Still, I’ve enjoyed my time using this phone taking pictures, connecting to 4G LTE and playing games. Average rating of 4.1 stars from 26 users. The OPPO A71 (2018) has impressive performance, main camera and battery life for an official price of ₱7,990.